Working from our Bayswater location in Victoria Australia, Merchandising Systems Australia (MSA) produce a range of standard retail and shopfitting components using high-quality materials and a professional finish. MSA have the solutions for: shopfitting brackets, shelf brackets, general purpose brackets, metal shelf brackets, ring brackets, adjustable brackets, wall stripping, surface mounted stripping, steel wall stripping, concealed stripping, concealed aluminium stripping, concealed aluminium strips, wall posts, slotted posts, slotted wall posts, slotted tube, slotted, shopfitting posts, back rail systems, t wall systems, back rails, prongs, shopfitting prongs, hanging rails. We produce a range of standard retail and shopfitting components using high-quality materials and a professional finish. If you require a custom design or modification we can also accommodate this. Australia's largest range of slotted posts, including single slot, double slot, block slot and H slot. 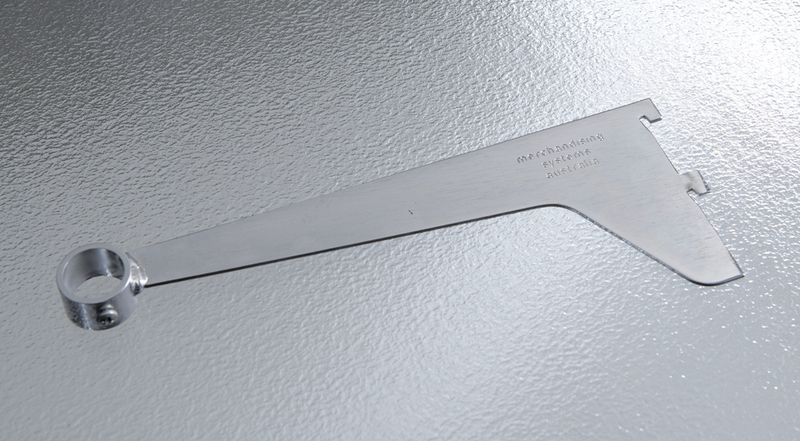 We hold stock in eight sizes and can also manufacture to your specific requirements. A wide range including concealed aluminium stripping, standard steel surface-mounted wall stripping and double slot surface-mounted wall stripping, which feature a heavy-duty reinforcement web, making them the strongest available on the market. Brackets available at 25, 40, 50 and 60 mm pitch in different lengths to cover all local and imported variations. 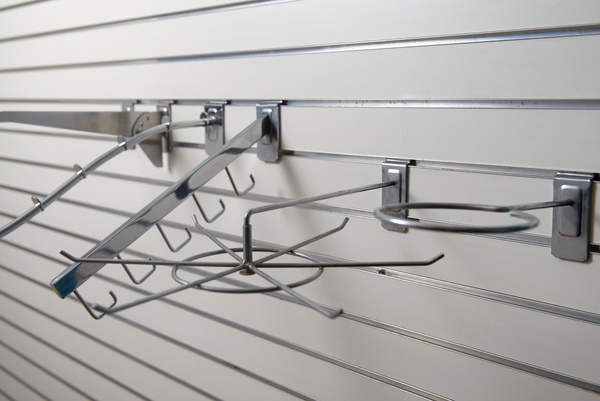 We can manufacture to your requirements and brackets can be side-slotted on request for use with timber shelving. An extremely flexible, easy to install merchandising system designed to optimise space and maximise visual appeal. 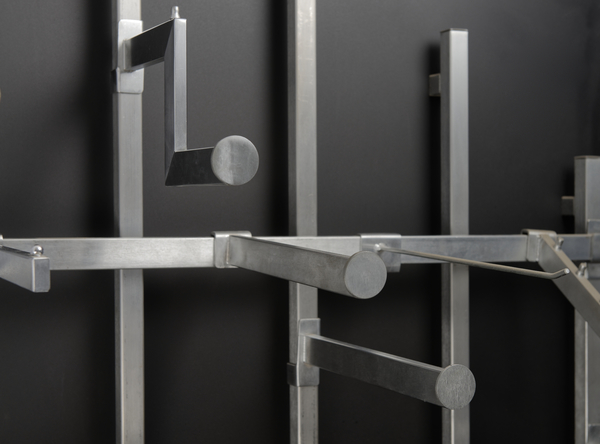 The back rail system adapts to both existing T-wall and slotted post layouts and components are available in the following finishes: bright chrome, satin chrome, linished chrome, powder coated (any colour) and raw. A flexible and simple system with a wide variety of applications, we carry a wide range of components and can manufacture to your needs in finishes include bright chrome, satin chrome, linished chrome, powder coated (any colour) and raw. 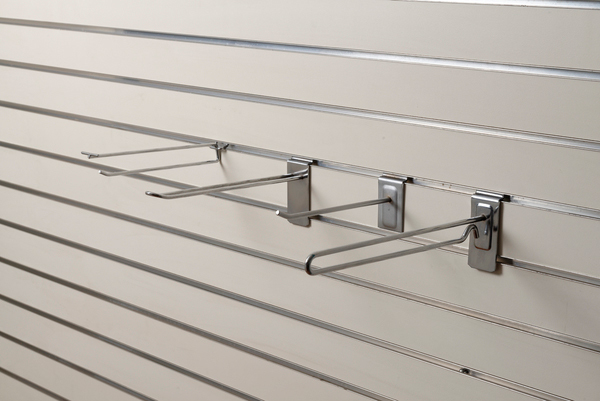 We manufacture a wide variety of shelves in metal, wire, timber and plastic. We can help you with any size, quantity and colour. Contact us for more information. 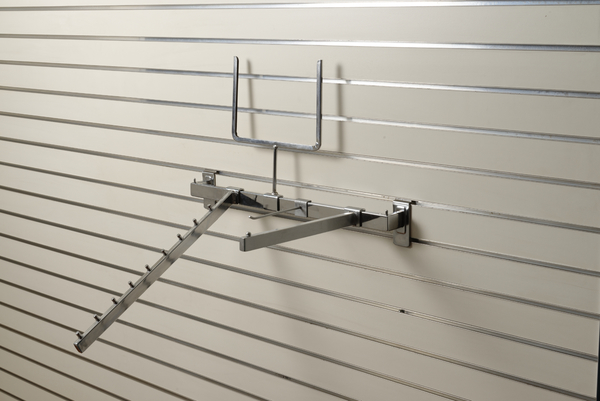 We carry a variety of standard accessories including shelf clips, top post fixings, post covers, feet, caps and hanging rail. All items are available in a range of sizes. To find out what we have available to meet your shopfitting requirements, please contact us. As always, if we don't have what you need in stock, we can custom-create a solution for you.